Fianna Fáil and the SDLP have entered into an "unprecedented and historic" partnership aimed at restoring public faith in politics. The parties announced a series of common policies with Fianna Fáil pledging to shake up efforts to resolve the powersharing crisis at Stormont. They promised a politics which works after more than two years of non-government in Northern Ireland, and moves to unite Ireland's people amid what they see as the threat posed to north/south cooperation by Brexit. They also said they would prioritise the delivery of public services. 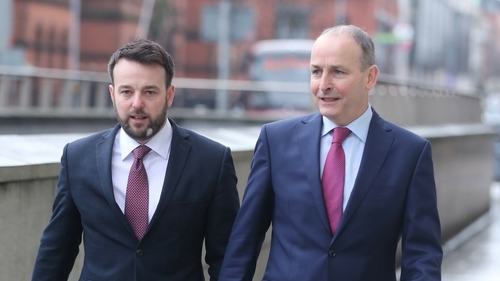 Fianna Fáil leader Micheal Martin said he supports the SDLP policy of taking its Westminster seats, consistent with the Good Friday Agreement. He ruled out standing candidates in Northern Ireland at this time but promised to support SDLP campaigns. He said: "We will be bringing extra capacity and endeavouring to help and assist in terms of electoral capacity and political know-how. "We have a really well-resourced approach in terms of electoral strategy, we want to share that with the SDLP. Collectively, we are stronger." On the prospect of a merger, he added: "This is not predominately about labels or parties. "The middle ground in Northern Ireland are looking for a new approach to politics, to make Northern Ireland work within the context of the Good Friday Agreement, that is what people want. "This is the best approach to try to make politics work, certainly over the next number of years." SDLP leader Colum Eastwood said: "Our parties are determined to work together to try and change the failure our politics lies frozen in. "We will not do so by gestures or gimmicks or through photo opportunities. "Instead we will do it through a focus on policy and issues, not party or sectarian positioning. "Both the SDLP and Fianna Fáil have agreed to work in partnership on an unprecedented programme of public engagement in Northern Ireland which can help frame an ambitious and practical agenda for the future of this island and our people." Mr Eastwood said the "glaring gap" in Northern Ireland politics was that nobody was implementing anything. He said his party's relationship with Fianna Fáil would "evolve". "We have time, we are not pre-determining the outcome."